OVEREADY has taken this classic and done the unthinkable by machining away the knurling that is such a distinctive feature of the SureFire 6P. The result is a smooth and clean finish that stays true to the original form but gives the light a modern and more stylish appearance. Available with either black or natural (gray) hard-anodized finish, the Custom Shaved SureFire 6P can be purchased as a host (with no light engine) or as a turnkey flashlight with a TorchLAB Triple LED drop-in (Review) or M2 Mini TurboHead (Review) already installed. 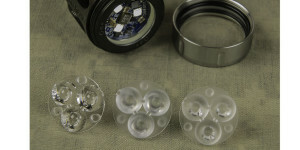 A selection of switches, lenses, bezel rings, and bezels provides additional options for configuring the Custom Shaved 6P in a number of different ways. A sample with black hard-anodized finish, “Smoothie” bezel, Copper bezel ring, Ultra-Clear Lens, and Diamondback tailcap was provided for this review by OVEREADY. Since actual performance will vary depending upon the drop-in used, this review will focus on the host itself. Beginning with the obvious, the smoothed body of the shaved 6P is strikingly different than the original form, particularly when outfitted with the Smoothie Bezel and Diamondback Tailcap. The original laser engraving remains completely visible but with a more muted appearance. The body is smooth without being slick due to the very fine texture left behind from the machining process. Although the process does remove some metal from the body, it is a surprisingly small amount. 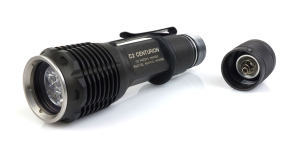 The overall diameter of the Shaved 6P is still within 0.04” of a stock SureFire 6P Original. The hard-anodized finish is smooth and consistent across all parts of the light. Much more than just a “coat of fresh paint,” the refinishing process is quite involved and requires several steps. To learn more about the process, visit the Custom HA Fire Red 6P Review for a full description of the work that goes into creating a hard-anodized host. The lustrous finish of the copper bezel ring stands out against the matte black of the bezel and provides a nice contrasting appearance. A wide selection of other rings is available including black steel, brass, silver and titanium as well as crenelated stainless steel versions. Staying with the smooth theme of this light, a Diamondback aluminum tailcap is used with a McClicky tailcap switch. 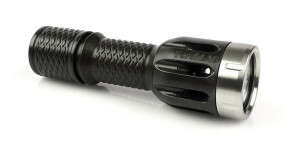 Additional switch options include the SureFire Z41 “twisty” switch, the ZeroRez Twisty, or the ZeroRez Mounty. 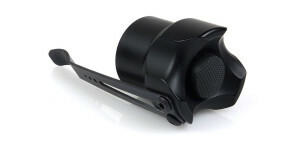 Some configurations are also available with a custom hard-anodized version of the SureFire Z41 tailcap. OVEREADY is known for boring their custom hosts to accept high capacity 18mm (nominal) diameter lithium-ion rechargeable batteries and the Shaved 6P is no exception. A battery retention lip with rubber O-ring bumper at the head keeps the battery (or batteries) in place when the bezel is removed. 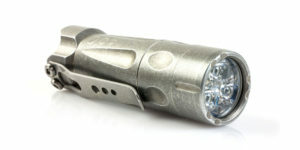 Double O-rings are used at the tail in place of the single O-ring used by SureFire. Fully disassembling the host shows how the hard-anodized finish extends to the inside of the bezel and the smoothly bored battery compartment. I’m on the record as saying the SureFire 6P Original is the most solid and future-proof flashlight host around. This latest variation from OVEREADY only enhances that status further by providing a new option for those who have wished for an alternative to the traditional SureFire knurling. It’s not just a matter of appearance as the smooth body and head can make the 6P much more “pocket friendly” and easier to carry. 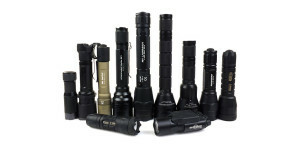 Of course having full compatibility with the huge assortment of accessories and other modifications designed for the SureFire 6P allows the light to be configured, or reconfigured, almost at will. In addition to the “Smooth” version, the Shaved 6P can also be ordered with a traditional SureFire Z44 bezel that has received the same custom hard-anodized finish and makes the light more resistant to rolling when placed on a flat surface. As with all other custom OVEREADY hosts, the Shaved 6P is built to get the most out of today’s high-powered LED light engines with its enlarged battery compartment and available switch upgrades. Pricing for the complete host begins around $130 and varies according to options. For more information about the Custom Shaved SureFire 6P, visit the OVEREADY website or use the links to specific items below.